In this lab we are going see the installation of Oracle Access Management using the LCM tool. Note: Here we are assuming that you have already installed the Life Cycle Management tool(LCM) and generated the response file for the same. Please make a note that the installation of Access Management will take around 2-3 hours of time. Each new phase must run sequentially, that is, each stage must be completed before the next stage can begin. Failure of a stage will necessitate a cleanup and restore and restart from the beginning. 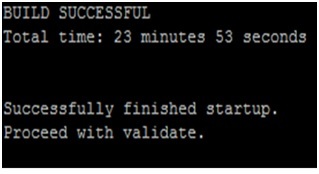 2) Script should run successfully with output as shown in figure below.